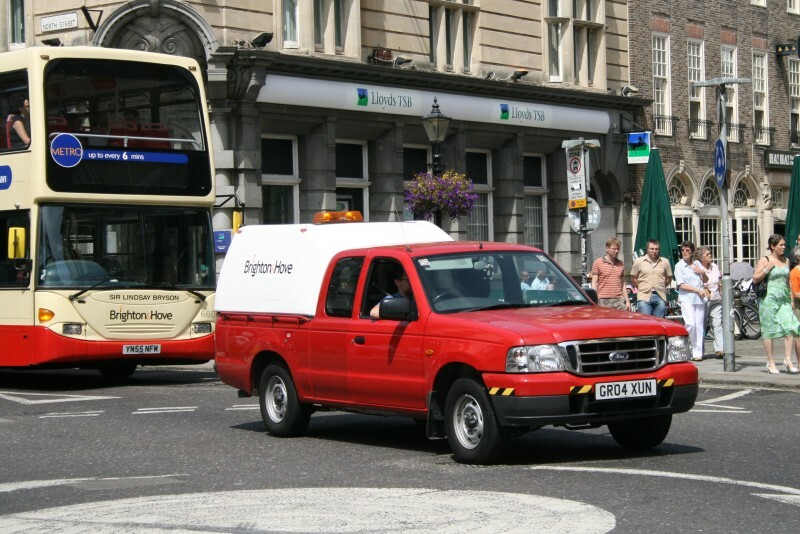 Details: My recent comments on Ford Rangers prompted Damon to send in photos of all three such vehicles operated by Brighton and Hove. As part of the very occasional coverage of non-London service vehicles, I am publishing this view of GR04XUN, taken on 30th July 2008 as it was being pursued by a Scania Omni-whatsit (Dekka?). The vehicle has a light-bar, hard-top and a small crew compartment without doors. Apart from the height of the hard-top, it would appear to be very similar to 'weedy' 5953F. Damon Taken half way down North Street, this is a great spot for photography on a sunny day in Brighton. Gives good shots for a couple of hours around lunchtime - this was taken at about 1330. There's an endless stream of buses down this road including open-toppers from Devil's Dyke and the City Sightseeing fleet as well. The main road at Churchill Square is also great earlier on. Those of you from London can get a Southern Daysave ticket on the internet for a tenner if you fancy a trip down on the Brighton Express from Victoria. Southern Advance is three quid each way or a Downlander is £12.50 and gives you buses as well. B & H do a Super saver for £2.80 on the internet - that's their whole network for £2.80 for the day - bargain! All these tickets are available on the internet. So why not get out of London for the day? !